What did Jesus mean by saying we must worship God in TRUTH? The root word for truth in this verse is alēthia, which means, “hiding nothing”. [i]So, to worship God in truth means that we are to come before Him, hiding nothing. It means that we must bare all to the One who sees and knows all. It means that we should come as we are, allowing our stained hearts to be made white as snow in the presence of our holy God who dwells in unapproachable light. READ 1 Peter 5:6-7. Write it down in your journal or on a 3x5 index card. Consider what this would look like for you. If you’re ready to stop hiding in worship, I sure would love to hear about it and pray for you. Click hereto leave a comment on my blog. Are you ready for more? 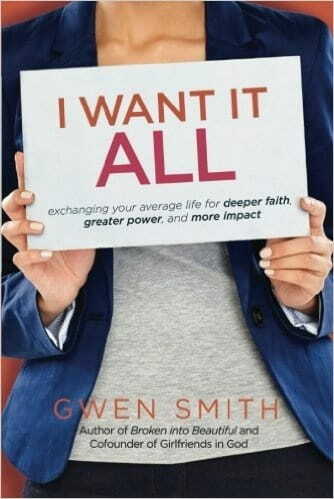 Today’s post is an excerpt from Gwen Smith’s new book, I WANT IT ALL, whichwill help you to experience more faith, more power, and more impact. More of Jesus. All of Jesus. Everything that God has for you. Order yours today from Amazon, Barnes & Nobleor ChristianBook.com.For a signed copy, get yours from the storeon Gwen’s website! [i] Arndt, W., Danker, F. W., & Bauer, W. (2000). A Greek-English lexicon of the New Testament and other early Christian literature (3rd ed., p. 42). Chicago: University of Chicago Press.